While I am wholeheartedly against books in the bedroom, I welcome them anywhere else in the house, especially the dining room. They’re the perfect inspiration for conversation during a dinner party and the perfect companions when dining alone. I wish I could have a dinning room like that, I agree, perfect inspiration for conversation. Alas, I’m stuck with mine in my bedroom, they’re not allowed anywhere else. I love it! 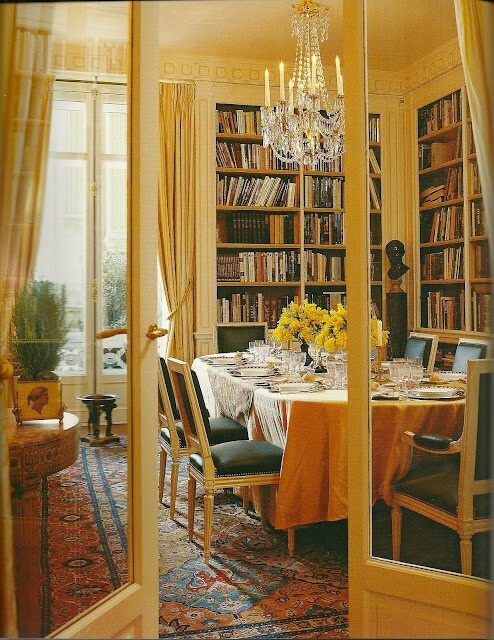 The style of room, the glazed doors, the Oriental carpet, the colours, the chandelier, the flowers and of course, the books. I love your library lust pictures each week. I just wondered why you are against books in a bedroom? I’m afraid to say I have books in every room including my bedroom. Very neat and great idea! Well I have lots of books in my dining room. But not a dining room table. Love it! Instant conversation starters (not that I’ve been accused of not starting a conversation -ha). Love this room! Grown-up without being at all stuffy. 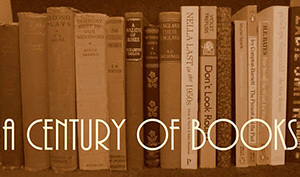 The long wall in our dining room is a built-in bookcase, about 21 feet, full of books. Though our table is a different style (Stickley Arts & Crafts) it’s about the same size. We don’t dine at it very often, but it’s great for sitting to peruse large art and reference books.